There are four different locations that we have. Three of them are in Chico. The first being CARD, which is on Vallombrosa, and we do that Mondays and Wednesdays from noon to four pm. Another location is the Dorothy Johnson Center which operates from noon to four on Saturdays. We also have our Chico State location at the BMU building, that's Mondays and Wednesdays from four to eight. So for people who can't get out in the middle of the day, they can go do that. We also have one location just outside Chico, in Durham and that's by appointment only. The VITA program goes through April 6th. We can also file extensions for people who do not have all of the necessary paperwork ready to file. Planning for the 2019 VITA program was actually much more difficult this year than last year due to the Camp Fire. Chico State identified the need for funds for a second student director to avoid impacting service levels, so we were really concerned that we wouldn't have enough funding to have a full VITA program this year. With support from Tri Counties Bank, and our own financial contribution from Butte CAA, we were able to have a full VITA program this year. Coordinating with Chico State's College of Business Accounting Department we find student volunteers. It's really great that the students get practical accounting experience while helping people and improving their lives. 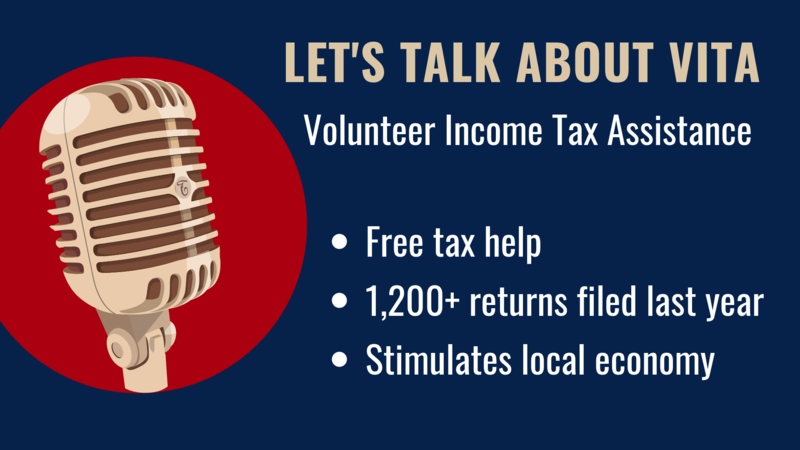 Last year we were able to help over 1,200 people file their taxes through this program, which resulted in a million dollars going back into our community. The real world implications of that one million dollars returning to our community is that there is an estimated 3x effect, meaning that there is a resulting three million dollars of total economic activity. So by maximizing people's returns, we encourage them to spend money. They go to the grocery store, pay for their groceries, that helps the store pay their employees, the employees pay their rent. It all comes full circle.